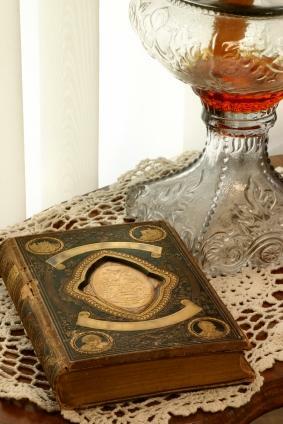 Books, doilies and lamps make great antique interior decorations, but there are many other items you may use. Before you decide to decorate with antiques, consider doing what the professional decorators do. When it comes to using antiques as accent items in your home, less is usually more. One of the biggest mistakes that homeowners make when decorating their home is trying to fill an entire room with a lot of accent items. The second biggest mistake is using too many fake plants. While using live plants is an easy fix, deciding how to pick and choose antique interior decorations may be a bit more difficult. The first thing you should consider when purchasing an antique decoration is the time period. If you were decorating a room to reflect the Civil War era, using Art Deco antiques would ruin the look. The same would be true of using a Victorian dinner bell in a 1950's kitchen or hanging a collection of straw hats in a room full of Danish Modern furniture. If running around the countryside shopping in antique stores isn't your cup of tea, the Internet offers a wide variety of stores to shop in. Finding that special antique can be as easy as the click of a mouse. However, there are a few things you should know before you buy any antique interior decorations online. Insist on insurance for any antiques that you purchase. If a seller won't offer this, walk away from the sale. Don't purchase antiques, other than books, catalogs or magazines, if the seller states it will be sent through media mail. Media mail can only contain certain paper goods; the U.S. Postal Service can confiscate any other items shipped this way. Carefully reconsider buying items from a seller who doesn't want to interact with the shipping service. If the seller wants you to file claims, instead of themselves, when an item arrives damaged consider doing business elsewhere. Only do business with sellers that offer a street address, phone number and e-mail address. If something goes wrong, you'll want to be able to contact the business. Be aware of what your credit card company covers, especially if you are purchasing an antique internationally. Some purchases are not covered, even if they are never received, when they are bought in countries outside of the U.S. Decorating your home with antiques can be a great project, especially if you are prepared. One of the best ways to prepare is to read decorator and collector's guides so that you know which period antiques will look good in your home. This also gives you an important understanding of acceptable price ranges. Online shoppers should protect their investment by understanding what their credit card company covers, requesting insurance on all antiques, and making sure that their items will be shipped properly. Finally, try to have fun when you are shopping for your antiques. Many antique dealers love to talk. They can also help you find specific items, making your shopping experience an easy one.